The tone of the 2016 Morningstar conference was decidedly subdued. Attendance was down sharply. Keynote speaker Bill McNabb of Vanguard took a “victory lap” to mark another year of rapid growth for passive funds. Active equity managers continue to get pummeled by outflows and rising distribution costs. These forces may have slowed in 2016 but the shakeout continues. Purveyors of actively managed funds are either reluctantly jumping on the ETF bandwagon or seeking defensible safe-havens like fixed-income, smart beta, and liquid alts. Liquid alts received a lot of positive attention at the 2015 Morningstar Conference – and negative attention this year. Liquid alts are funds pursuing alternative investment strategies and offering daily liquidity. In other words, these are hedge funds marketed in “40 act” garb. Generally, investors look to alternative investments to deliver returns with below average market correlation. Common investment strategies include Long/Short Equity, Long/Short Credit, Market Neutral, Managed Futures, Event-Driven, and Short-Selling. Fund managers can reduce risk by selling one security against another, hedging, or buying derivatives. Some are trying to deliver a market neutral return; others are trying to outperform an equity or fixed income benchmark with lower volatility. Sometimes the distinction between categories is a little blurry. We identified a liquid alt universe of approximately 500 funds. Morningstar tracks 650 so either they use a more expansive definition or our “universe” has a few black holes. We apply two main criteria: (a) the fund describes itself or is widely categorized as an alternative strategy (b) in our assessment, it acts like an alternative fund, meaning we can’t replicate the returns using traditional strategies. We count approximately $280 billion of liquid alt assets under management. Two thirds of these funds are single strategy, the balance are MultiStrategy. Fund of fund and sub-advisory structures are not uncommon. Some liquid alt vehicles offer investors performance which is pari passu with hedge fund classes. Others offer a separate account which may have tailored guidelines or a risk management overlay. For example, one of the fund managers we spoke to noted that he asked his subadvisors to dial down European risk before the Brexit vote. Implementation of alternative strategies in “40 Act” formats requires higher balances of cash and liquid assets – particularly for the pari passu offerings – which is a drag on returns. A few funds pay performance fees to subadvisors. Even purveyors of these funds concede there is confusion in the marketplace about the proper role for these funds in investor portfolios. Nonetheless, the liquid alt industry has boomed over the past 8 years. The allure for investors has been access to strategies previously available only in hedge fund format. According to GSAM, Liquid Alts outperformed equity by 23% and fixed income by 16% during bear markets. The allure for fund companies has been an infusion of new assets earning higher expenses. The average expense ratio for long/short equity is 174 bps. Established managers who can raise money at 2 and 20 may not participate, but there are plenty of second-tier managers ready to step in. The success of liquid alts has attracted a lot of new entrants. 45% of liquid alt funds are under 3 years old. (Our data for this article runs through April 30, 2016.) But the new funds have ramped slowly: only 13 % of the industry AUM are in those new funds. Growth stalled a year ago. Judging from the number of funds and the assets they attracted, the greatest interest is in Long/Short Equity and MultiStrategy funds. The biggest players in our database are BlackRock, GMO, AQR, Pimco, JPMorgan, and GSAM. Some of the industry giants like Fidelity and Cap Re have been notably absent. Despite the surge of interest (or perhaps because of it) results from liquid alts have been rather disappointing. 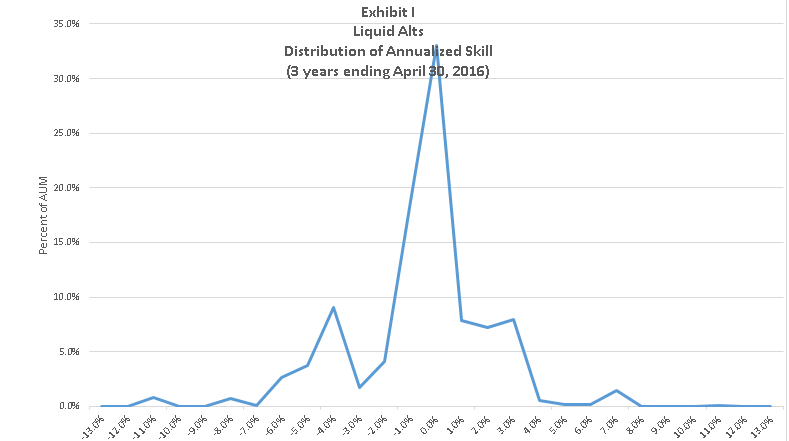 Skill as measured by FundAttribution.com for liquid alts in the aggregate has been -1% per year over the past 36 months. Our sS measure adjusts the gross return of these funds for any return from equities, fixed income, commodities, or currency which we could have mathematically replicated with passive indices. Other metrics may assess skill differently. For example, alt funds (particularly Futures strategies) show slight pickup from Beta which might offset the negative skill. One way of interpreting our findings: as these strategies have gotten crowded, the performance which fueled interest has evaporated; and the cost of offsetting or hedging away risk exceeds the benefit. Our take is that returns in Liquid Alts are governed by supply and demand. Just as individual managers have limited capacity, returns for the strategy suffer when too much money rushes in. Managed Futures showed excellent returns through 2009 and poor results ever since. From what we can discern, this strategy tracks mainly commodities and currencies. While the funds are supposed to go both long and short there is a significant correlation between the category and the Barclay CTA Index. So when commodities suffer, it is hard for this strategy to work. 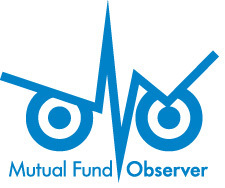 These funds rely heavily on momentum and trend-following, a strategy which has been challenging of late. Many hedge funds seek investments with asymmetric risk. And many strive to capture most of the market in bullish periods while declining less in a down market. However, our preliminary work suggests the major liquid alt strategies haven’t delivered on this promise. For example, using Morningstar data, the Long/Short equity category captured 41% of the upside of the S&P500 as compared with 61% of the downside. Even if the market as a whole has become efficient, there is a wide range of returns among liquid alt funds. The standard deviation of sS is 3.3% for liquid alts (higher than for other asset classes we studied.) See Exhibit I. So even if sector returns disappoint, we can try and identify individual funds poised to outperform. FundAttribution is a great starting point for comparing liquid alt funds. Funds in the same category may have very different correlations and factor exposures; but our metrics normalize the impact to permit clean comparisons. Even the drag from holding extra liquidity can be isolated. For example, AQR Managed Futures Strategy (AQMIX) returned roughly 3.6% (4.7% gross return) on an annualized basis from inception through 3/31/16. We estimate that without directional bets on commodities and currency, that return would have declined to 2.6%. That return is fully explained by the fund’s exposure to credits markets. So we don’t ascribe any skill to the manager. Here are some funds which show well. Some had strong sS over the past 3 years in relation to expense ratio. Others have done well over a longer period. Not all of these made the Trapezoid Honor Roll (implying 60% confidence that next year’s net return will be positive.) Some don’t have enough track record and others are too small. One Honor Roll fund is Vanguard Market Neutral Fund (VMNIX). The fund has been around since 1998, costs are very low. (The minimum investment is $250k.) Around 2007 Vanguard replaced the subadvisor with its own Quantitative Equity Group; since then sS has been exceptional. Most of the return is based on buying stocks cheap using fundamental analysis and selling expensive stocks in the same sectors. The investment process is systematic but human judgement plays an important role. The strategy has grown from $0.3 billion to $1.7 billion over the past 18 months but there appears to be plenty of remaining capacity. Much of that growth has been through Schwab. We also observed an independently managed liquid alt parking its excess cash in VMNIX. Investors who register for the demo can access additional analysis of VMNIX and other Market Neutral funds at www.fundattribution.com. The eight largest liquid alts in our universe registered negative sS over the past 3 years. One large player which has performed well is Boston Partners Long/Short Research Fund (BPIRX). Historically, net exposure has been 40 to 60%. BPIRX is closed to new investors. Boston Partners Global Long Short Research Fund (BGLSX) is currently open. We do not publish metrics on BGLSX because the management team has been on the job less than three years. Event Driven has been one of the stronger liquid alt categories in recent years. For investors who want exposure, IQ Merger Arbitrage ETF (MNA) is a passive ETF managed by NY Life. which goes long announced deals and hedges out market risk by shorting equity indices. The event-driven category encompasses many strategies; this is one of the more vanilla. Demand in this category has been relatively stable which may have aided returns while supply (M&A volume) was robust. But M&A activity may be poised to fall. The rapid expansion in liquid alts has not gone unnoticed by regulators. The SEC has moved recently to regulate use of derivatives by mutual funds, which it views as a form of leverage. A draft rule 18f-4 was circulated December 2015 and industry comments were submitted in March. An industry association estimates that funds managing $600 billion would be impacted by the rule. One of the nettlesome provisions would regulate leverage based on the gross notional value of derivative positions. A coalition led by AQR and John Hancock seeks to modify the rule. They note some asset classes like currencies and futures can sustain higher leverage. Among other things they want the limitations to reflect the value at risk, relax requirements to post cash, and give greater leeway if a fund temporarily exceeds the ratio. We also observe that funds like AQMIX have many offsetting risk positions. So while we share the SEC’s overall concern, their starting position seems extreme. Everyone is taking potshots at hedge funds these days, that extends to liquid alts in “40- act wrap.” The growth phase is largely over; a few funds have closed. It will be interesting to see how much the SEC rules are relaxed and how fund structures hold up during periods of volatility. We do find some funds which delivered in the past. We would not be quite so generous as Morningstar in awarding 4 or 5 stars, because the statistical significance of their short track records is simply too low. Even if investors can identify skilled managers, they need to consider the timeliness of the strategies and monitor how quickly they gather assets. Opportunities (supply) in these markets come and go, demand is not always in synch. You can either skate to where the puck is going or be patient and diversify. This entry was posted in Leigh on July 1, 2016 by Leigh Walzer. Mr. Walzer is the principal at Trapezoid LLC and publisher of FundAttribution.com. He has 30 years of experience in the investment management industry as a portfolio manager and investment analyst including seven years at Franklin Mutual. In addition to his work evaluating active managers, he is well known for his work in the area of distressed debt and special situations. He received an AB in Statistics from Princeton University and an MBA from Harvard University.